Objective: Use proper protection against unsafe noise levels. Review the information below on hearing hazards and hearing protection. Ask the workers to share some of the reasons why they do not wear hearing protection. Show them that hearing protection does not block warning signals, machinery, or speech. Measure the level of noise from typical equipment—chain saw, leaf blower, mower, tractor, etc.—with a sound level meter. Some workers ignore the need for hearing protection. They resist wearing hearing protection because they do not think they need it. Workers might also think that protection will be uncomfortable. This is frightening because hearing loss is gradual; workers can gradually lose some of their hearing before they realize it. By the time workers reach retirement age, they will suffer hearing loss and social isolation. There are earplugs and earmuffs that give good protection. They are comfortable and easy to use. Formable plugs are spongy, soft compressed, or shaped prior to insertion. They are expandable to provide a snug fit. These are disposable. Formable plugs are not for reuse. Pre-molded plugs are made of soft, flexible material preformed to fit the ear. They must be fitted (sized) for each ear. These plugs are for reuse. They must be washed after each use. Use premolded plugs when hearing protection is used on a regular basis. Earmuffs are adjustable headbands with soft cups and cushions that seal around the ear. Workers may wear plugs under muffs for additional protection. Muffs may be more comfortable to wear over a longer period than plugs. Workers should not wear earmuffs with eyeglasses or any other obstruction. Muffs may be the best choice for occasional users or occasional users of noisy equipment, like a grinder. Not all materials can block the same amount of sound. The manufacturer indicates how much noise (in decibels) the hearing protection device can block if used properly. This is called the noise reduction rating (NRR). For general use, look for a NRR of 25 or greater. 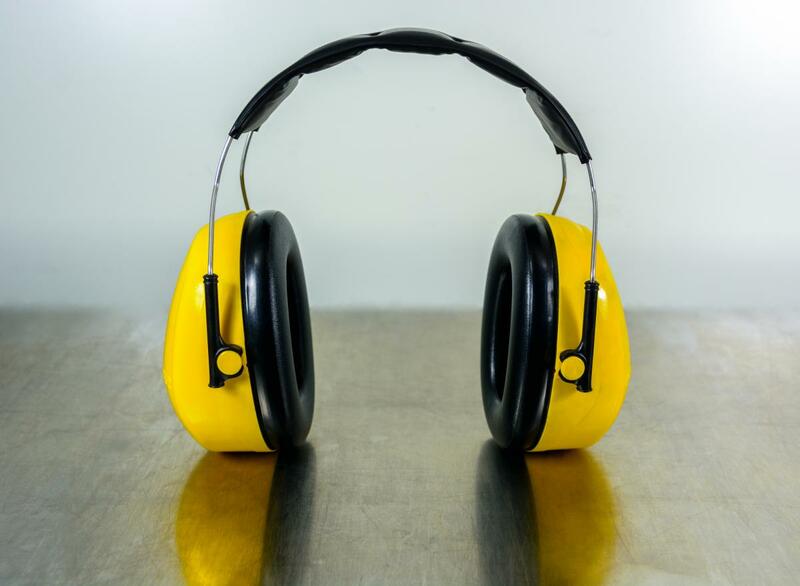 In extremely noisy conditions, workers should use both earplugs and earmuffs. Prolonged exposure to loud noise can result in permanent hearing loss. Short-term exposure to loud noise can result in temporary hearing loss. Short-term exposure to very loud noise can result in permanent hearing loss. Too much exposure to loud noise can result in stress from constantly straining to listen and be heard. Noise can cause you to miss important safety instructions. you hear ringing or other noises in your ears. you have a hard time hearing people when they talk to you. you are unable to hear high pitched or soft sounds. If you experience any of these problems, tell your supervisor. You may need to have your hearing tested. Noise is defined as sounds people prefer not to hear. Noise is especially dangerous in the workplace because it interferes with communication and disrupts concentration. Sound is measured in decibels. Noise of 85 decibels or greater affects your hearing if you work around it eight hours a day. Some sample decibel levels are listed below. Protective earmuffs or earplugs can reduce noise levels to the inner ear if used properly. Use hearing protection when noise exposure cannot be controlled adequately by environmental changes or administrative changes, like moving farther away from the noise. It is a good idea to wear hearing protection when average noise levels exceed 85 decibels for prolonged periods. Good protection against noise depends on the seal between the surface of the skin and the surface of the hearing protector. Be cautious because protectors can become loose and create leaks. Having a leak does not protect the ears from harmful noise levels. Talking and even chewing can create a leak in the protection. Earplugs should be made of a soft material like neoprene. Earplugs should also be properly designed, well-fitted and clean. Noise that exceeds 85 decibels for prolonged periods can cause hearing loss. Good protection against noise depends on the seal between the surface of the skin and the surface of the hearing protector. It is important that hearing protection is worn properly and regularly. If workers hear noise in their head or ringing noises in their ears at the end of the workday, they may have been exposed to too much noise. Precautionary measures should be taken.